In New York City, tourists often observe that there seems to be a pizzeria on every block. Locals will explain why this pizzeria is superior to that one — and why, if you want the best meatballs, you'll have to hit up that other pizzeria two streets down. Head to popular American Flatbread Burlington Hearth for a classic taste and an all-ages atmosphere, or to Pizzeria Verità if you'd like a sophisticated cocktail with dinner. Mr. Mikes Pizza is the late-night spot for generous slices and cold beer, while Manhattan Pizza & Pub serves pies with a side of live music. Don't want to leave the house? Call Leonardo's for home delivery. The hottest pizza these days seems to be Neapolitan, named for the Italian city of Naples, where the style is said to originate. This fall, Burlington welcomed two such additions. 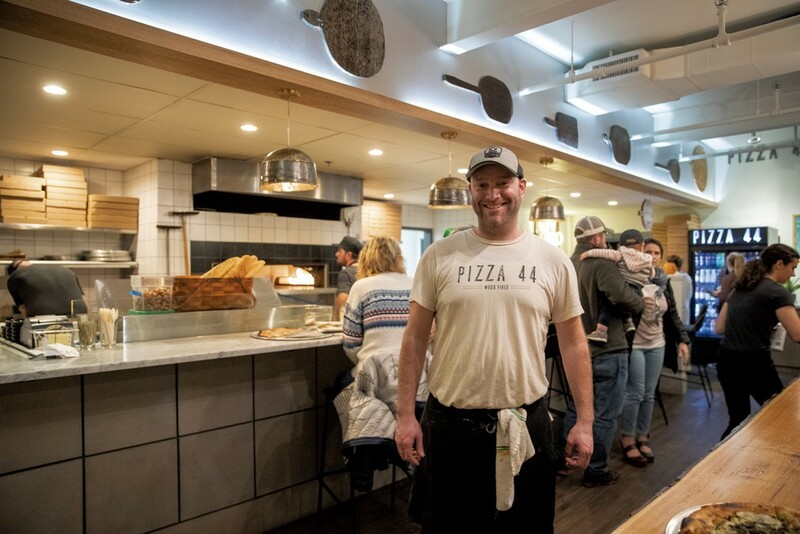 In the South End, Pizza 44 opened in mid-September. Pizzeria Ida, in a tucked-away spot in the Old North End, followed two weeks later. 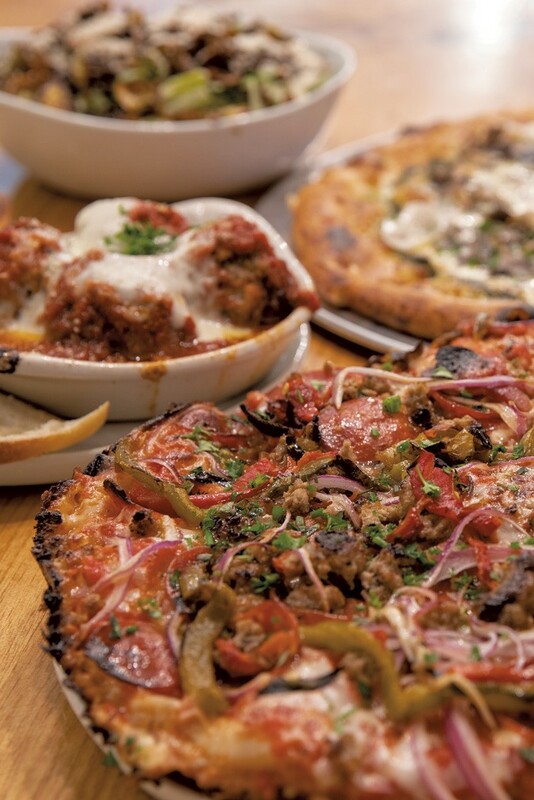 Both offer thin-crusted Neapolitan pies, along with a heftier, deep-dish option: a skillet-cooked Greek-style pie at 44 and a Sicilian-style square pie at Ida. Both places self-identify as family friendly, and both express pride in making nearly everything from scratch — with as many local ingredients as possible. And yet, a meal at one place bears little resemblance to dining at the other. What's the difference? How do the newbies stack up? Two Seven Days food writers went to find out. On a chilly mid-October afternoon, two food-industry colleagues and I sidled into one of Pizza 44's booths overlooking Pine Street. We chatted about the owner, Tim Williams, an office-supply entrepreneur who veered into food service. Two years ago, he reopened Archie's Grill in Shelburne and shortly thereafter added the Scoop ice cream shop next door. We agreed that Williams must be feeling optimistic about working in the food business and marveled at the restaurant's symbiotic relationship with Queen City Brewery, which occupies the back of the building. 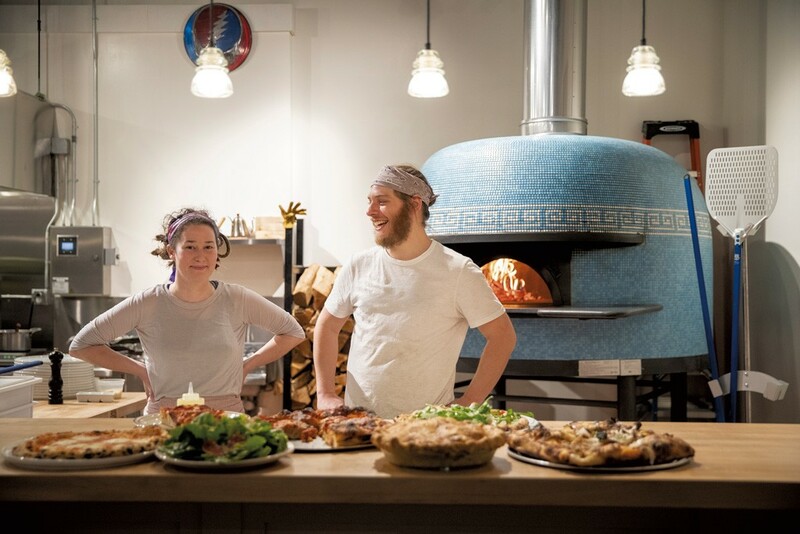 Brewery patrons can bring pizza to the tasting bar, and the pizzeria is the go-to caterer for events in the brewery's new banquet room near the front door. And, of course, there are lots of Queen City brews on Pizza 44's draft list. What to order? Pizza was a no-brainer, but we weighed the merits of lunch-hour panini ($7 to $10 and served with chips from Archie's) versus chicken wings. Chef Steve Erceg is from northwestern New York, and we'd heard his flappers were good. After ordering their food, some diners seated themselves at the long communal tables in the center of the room. Others slid into counter seats, which offer a close-up view of the open, white-tiled kitchen where cooks prepped pizzas and shuffled them in and out of the gaping oven. In the end, we settled on altogether too much food, and the server brought dishes out one by one as they emerged from the line. Everyone enjoyed Erceg's Brussels sprout Caesar salad ($9), a wide bowl piled high with crisp romaine, crunchy sourdough croutons and fried sprouts showered with Parmesan. The dressing was mild but pleasant; the croutons crunchy but not too hard. A crock of meatballs ($9; Erceg's grandmother's recipe), smothered in red sauce and melty housemade mozzarella, balanced fluffy lightness gleaned from a dollop of ricotta with the heft of the pork and beef. No one could argue with the wings ($7 to $12), which were tossed in a tingly, from-scratch Buffalo sauce the chef learned to make as a teenager. Its secret, Erceg confided, is lots of butter. We were half full by the time our pizzas arrived, but we enjoyed them anyway. The Neapolitan-style crusts were properly blistered and chewy. The toppings were agreeable enough, though all at my table noted that a cheddar-apple-bacon number ($18 for a large) could have used a little something more — ranch dressing? 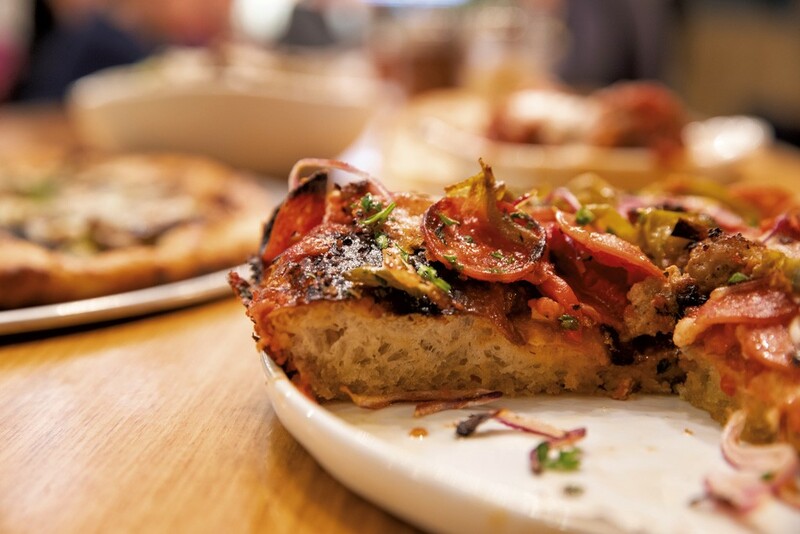 We unanimously praised a puffy deep-dish pie topped with pepperoni, sausage, onion and peppers ($17). Last week, Erceg explained that each new batch of pizza dough is leavened with a poolish — baker lingo for any pre-fermented dough made with a pinch or more of commercial yeast. 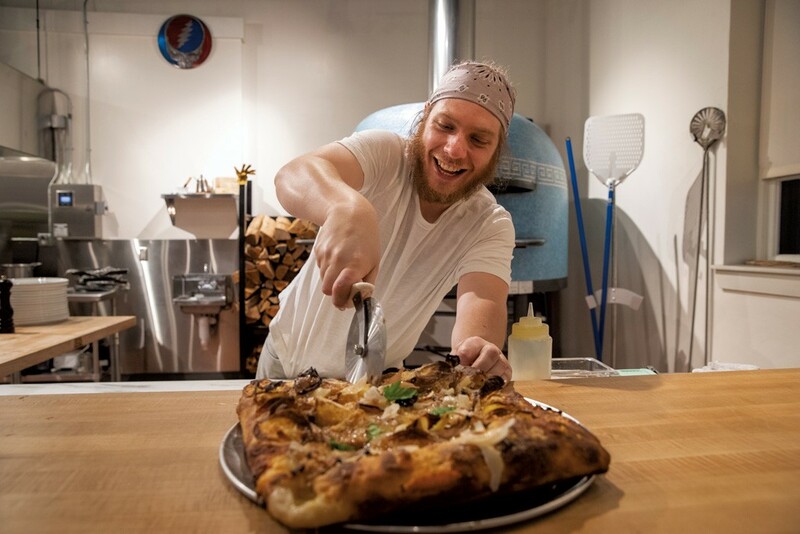 "Our first batch of dough is in every batch of dough," the chef said, when asked how his crust differs from others around town. "We use three-day-old dough as our starter, but we're using flour, water and yeast like everybody else." But I knew I'd found Ida, which I scoped out during off-hours, when I heard a voice calling to me: "Hey, how long are you going to be there?" The question concerned my car and where I had parked it. "Just a couple of minutes," I said, tracing the voice to the window. "I'm looking for a pizza place." "That's us," Dan Pizzutillo said. I'd already figured that out. Pizzutillo and his partner, Erika Strand, are from Philadelphia, and I'm intimately familiar with that city's tradition of yelling at strangers about parking. I told Pizzutillo I wanted to know if they'd be open later that day but couldn't find their phone number. "We don't have a phone," he told me. "We like to talk to people." No Facebook, either? I checked. "I'm 31 years old, and I've never used Facebook," he said. I hadn't had a bite of his pizza, and I was already a fan. My affection grew with each of my two visits to Ida. I returned that night with my daughter and beer. (Ida is BYOB.) We took a seat at the counter facing the blue-tiled, wood-fired pizza oven that was imported from Naples. This gave us a front-row view of the pizza-making counter and a chance to engage in Philly-style banter with Pizzutillo. Along the way, we ate a divine Caesar salad — Intervale-grown lettuce with bits of bacon and Parmesan, dressed in olive oil, egg and anchovies — and devoured a blistery, chewy pepperoni-and-shallot pizza that emerged from the 900-degree oven in 90 seconds. "We like to keep it a little hot," Pizzutillo said. "It gives that crust a nice pop; we call it a little kiss." Pizzutillo and Strand, 28, moved from Philadelphia to Monkton in the spring of 2017 after working for about a decade at Philly restaurants. Investing in a pizzeria, Pizzutillo told me later, "was always our dream." They opened Ida six weeks ago in the beautifully renovated former home of Very Merry Theatre. Ida is itself a merry little theater, with its cathedral ceiling painted slate blue, lighting by Conant Metal & Light, music by the Dead, and dialogue by Pizzutillo and the lucky bit players sitting at his counter. The theme of the show, of course, is food — and the star is pizza made by Pizzutillo with a purity of purpose. His dough is naturally leavened, his sauce made with imported San Marzano tomatoes and sea salt. Toppings are limited and change up, with choices including garlic, roasted shallot, pepperoni and anchovy. The pies come in two styles: Neapolitan, with its thin and crispy crust, and a square Sicilian made from a three-flour dough blend that is aged for a few days before becoming pizza. This imbues the bread with flavor, for a result that reminded me of the simple but mouthwatering tomato pies at the Italian Market in Philly. "It gets back to doing things in a slower way," Pizzutillo said. "It creates a much more beautiful, natural, living bread that old-world people are used to." Ida will serve take-out pizza if it has boxes, but Pizzutillo said the pizza is made to eat in-house, where it tastes better. In addition to the pizza bar by the kitchen, the restaurant has one near the front door and two tables. A pizza and salad will serve two people, though I could probably eat a Neapolitan by myself. A round pie costs $15 to $18, and a square one $24 to $28, plus toppings. Salads ($12), snacks such as olives and artichoke ($8) and escarole and bean ($10), and sweet offerings such as house-baked pie made with Ploughgate Creamery butter and Yates Family Orchard apples ($8 per slice) shuffle on and off the menu. Its permanent features include a cheese-and-tomato calzone ($22) and a margherita pizza with buffalo mozzarella ($18). "We get bored," Pizzutillo said. 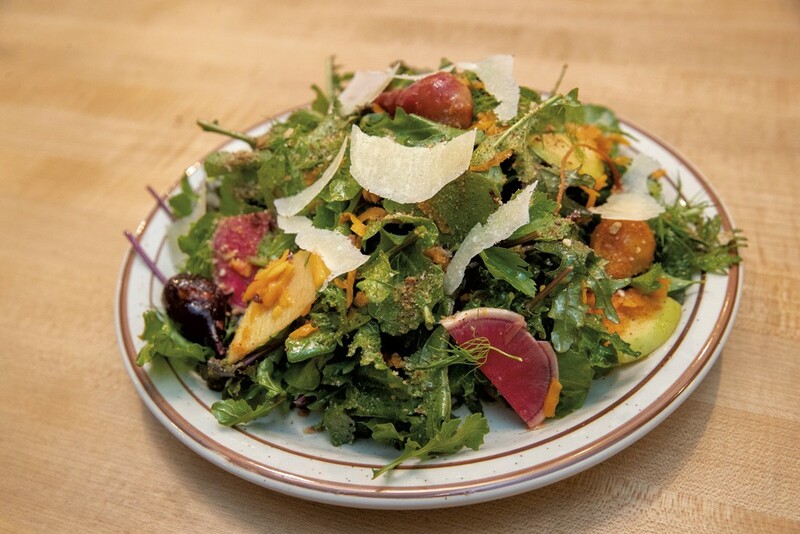 "We have a new salad on the menu: arugula and baby kale, salt-roasted beets, baby artichokes, local apples ... We like to have a well-dressed salad to pop in your mouth." While you won't find Ida on Facebook, you can check out pictures and hours (Wednesday through Saturday starting at 5 p.m.) on Instagram. You'll know you're in the right place if the dough man comments from within about where you park, you find the space inside clean and contemporary, and the soundtrack is Dead-forward. I'm grateful for all of it. The original print version of this article was headlined "Slicing It Twice"